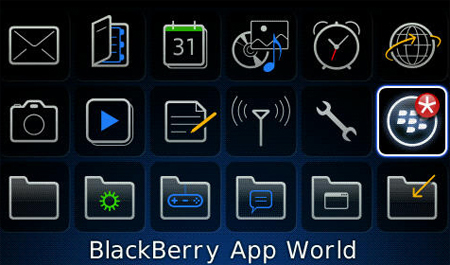 Like other apps, the application also has a similar function is to lock certain features on your blackberry. The difference is, if the lock apps function to lock the application of this so it can be used by others without permission, an application that serves to lock in your personal item such as a picture, video or other files that you do not want to just anyone. In the hide using a password that you can set yourself. To add a file to the application, users can access the option by pressing the menu button when in the gallery feature. By default the BlackBerry Smartphone does not feature in any application and complete weather forecasts. For that you need to add third-party applications in order to get the functionality. There are many options available in the app world, one of which is the weather trax made by jared company. This application provides a choice of locations almost all major cities in the world. What is interesting user can select more than one city. When there is an incoming phone call to your blackberry, only two options that can be taken, reject (reject) or receive a call. But what if you are in certain situations that do not allow you to be in a particular situation that does not allow you to answer the call but it turns phone calls from people who are important to you. Of course, another option in addition need. With this application you seemed to have an assistant who reject the call and automatically send an SMS to the caller. There is a wide selection of messages or you can create your own message as desired. Applications call blocker pro to help you avoid incoming calls that are not in want. Configuring the application was fairly easy; users simply select the number from the contact list on your phone and then select the type of block. There are 3 options block, including allow, block, and ignore.